If you think I’m alone in a guy’s world, you’re wrong. I am in very good company. Women are playing a large role in the craft beer industry. We’re working as brewers, as managers, as distributor reps. In my 5 years in the industry, I have watched as women put their stamp and their perspective on what I believe is an art and a science. 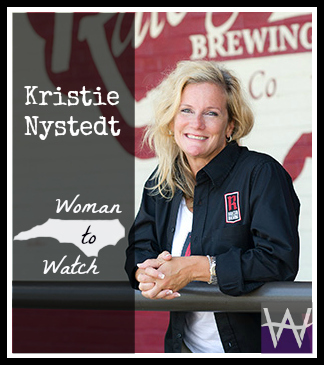 One of those women is Kristie Nystedt, and this month she is our “Woman to Watch” in North Carolina. Kristie never planned on joining the beer business — at least not any time soon. A Raleigh resident, she worked in the health care financial industry, and made her home in the corporate world. Her husband was and still is a pilot. A few years ago, they hatched a retirement plan. “The plan was initially to play a safe route. Both of us were busy and had ‘safe’ jobs. The idea was we would open a bed and breakfast brewery along the coast with a pub-type atmosphere,” Kristie told me. What a cool idea. A Bed and Breakfast – with awesome beer at the beach? I’m sold. But Kristie and her husband soon realized that the time to strike on their craft beer dream wasn’t 10 or 15 years from now; it was now. They opened >>Raleigh Brewing Company last year, and now are making a name for themselves with a 20-barrel brew house. They brewed 1,000 barrels last year—and this year, that number has more than doubled. Next year they’ll start canning. “It just came. We started investing more in equipment and getting more in the local scene and talking to local people, and noticed opportunity now,” she said. Her husband, who spent the last 15 years home-brewing, manages the beer part of the business, while Kristie drives the direction of their brewery – which is already making a name for itself. “I have the business background working with corporate America, and I feel like this is for me, as long as it’s a business and it’s something I can be a part of. I like creating the passion behind Raleigh Brewing, and making sure we’re strategic,” she told me. Strategic because Nystedt’s goal is to grow the brewery into a mainstay — a hallmark of Raleigh and the North Carolina beer scene. She sees the potential, driven by consumer interest, and willingness to pay five or even seven dollars for a pint. Aside from that, this state has and is supporting craft beer. Much of the state’s water has low mineral content, which is great for making consistent craft beer, since brewers have to add very little to the water. State law doesn’t require brewers to go through a distributor to sell their product, which gives small breweries a chance work to grow. 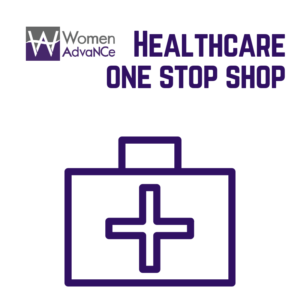 Nystedt is participating in the Women AdvaNCe >>NC Women’s Summit, taking place on Friday, September 26th in Raleigh. 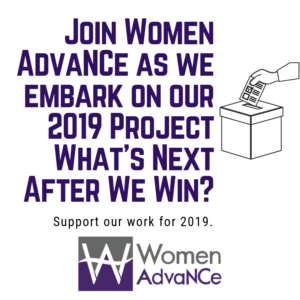 You can, too — register for $12 (or inquire after our scholarships) and have the chance to meet and share ideas with other North Carolina women with the same goal — to help foster and support the success of women in this state. You might just get a free beer or two, too. After you register for the Women’s Summit, go buy a craft beer if you don’t already have one or two or twelve in your fridge. I hear all the time from women who say, “I don’t like beer.” What you mean is that you don’t like the mass-produced pale yellow carbonated liquid we all bought in college because we couldn’t afford anything else. Try CRAFT beer. There’s a difference, and know you’re supporting women like Kristie and an industry that’s giving people one more reason to visit this state.